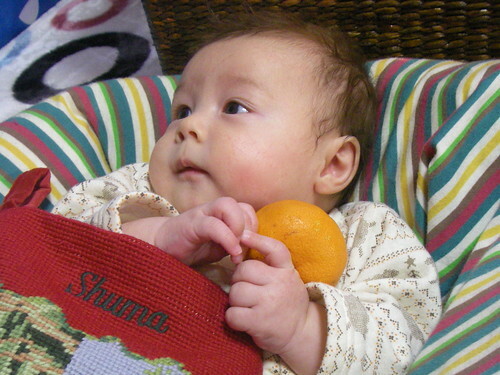 We just finished celebrating Shuma's best Christmas ever (ours too), and before Shuma and I head off the in-laws in Osaka to begin New Year's celebrations I thought I'd share some holiday pictures. 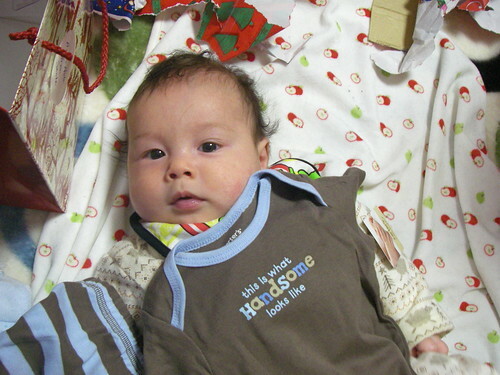 Hideaki was working the night shift in the week before Christmas, so we got off to a late start. And to compensate we stretched the holiday out over the weekend, with our Christmas dinner and traditional opening of a single Christmas Eve present on the 25th, and the opening of the rest of the presents on the 26th. Chrismtas dinner was a lovely chicken (people don't really do turkey here) that I bought already cooked (a basic roast chicken is a dish that I still can't get right, and I know better than to try again with a baby around) followed by a beautiful cake. 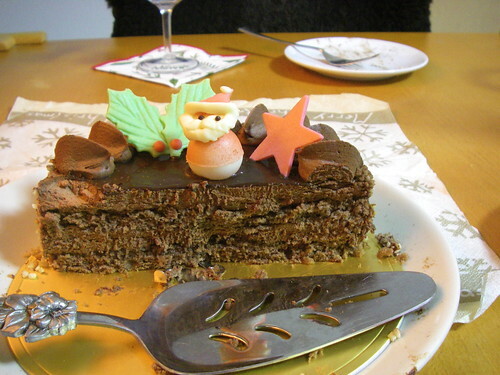 Also store bought, of course, at our local patteserie. 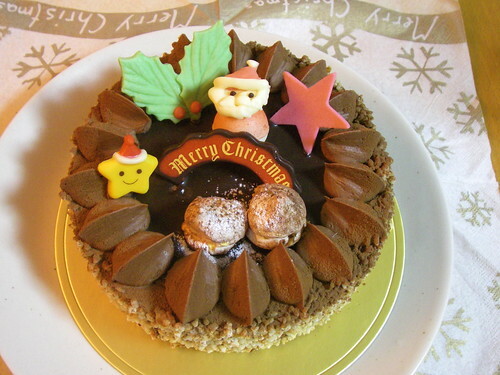 Actually my parents bought it when they were here earlier this month, as Christmas cakes are usually pre-ordered in Japan. I couldn't tell you what was inside, because I'm not much of a cake person, except that it involved layers and layers of chocolatey goodness. It was very nice, and I could become a cake person just for this. Thanks Mom and Dad! 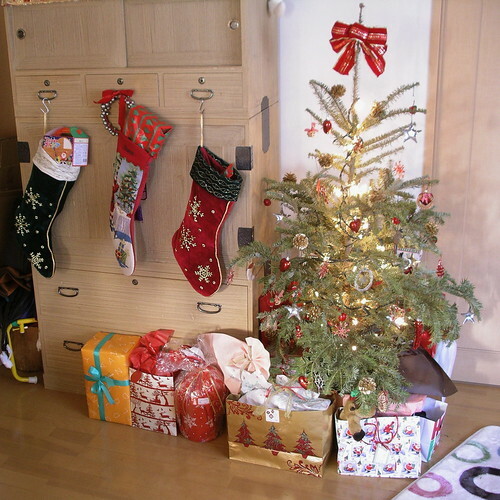 The next morning we awoke to full stockings- and one more than usual! 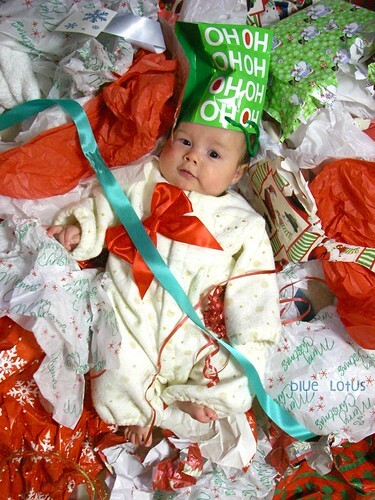 Yes, Santa remembered that it was Shuma's first Christmas, and went all out. 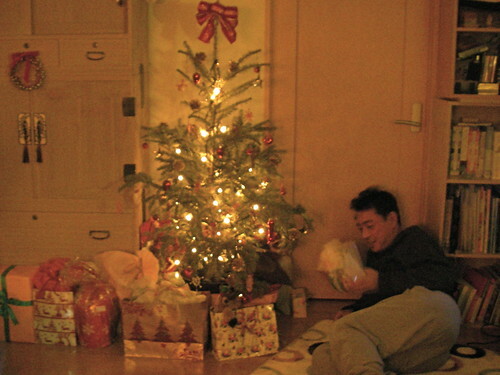 Most of the presents are from my parents and other family and friends, which we're very grateful for. Hopefully next year we'll be better able to shower Shuma with the material goods he so deserves (and he'll hopefully be old enough to appreciate it more). Did you know that it's very hard to pose for family pictures with a baby? Yes, you probably did, and now we do too. 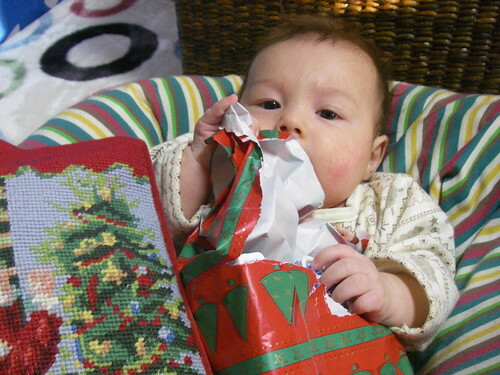 Shuma was quite interested in the wrapping paper and packaging, as babies are supposed to be, and was also impressed with most of his presents. He didn't particularly care for this clementine though. Now Shuma and I are off to Osaka. I'm wishing all of you a Happy New Year! Hehehe, in the first picture his expression is saying "Jeez, mom, this is so goofy..."
He's a right little charmer! Thank you for sharing the spirit of Christmas and I hope a smidgin of the love and goodwill you have sent out into the blogosphere boomerangs right back to you. He's adorable! The cutest elf ever! This time last year, could you even imagine how different Christmases would be for ever more? 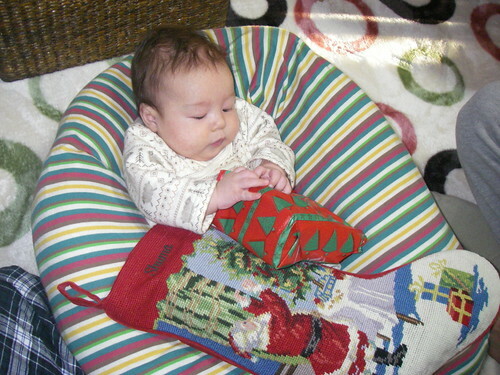 Love Shuma's stocking, did someone stitch that especially for him? It's such a joy that a new family member has been added as I've also delivered my first baby boy in August. Looking at adorable Shuma makes one so proud of him. I notice this cushion like holder(with color strip) u place him on makes me wonder where can I get it too. Can u share with me on where you get the cushion from?